Last two weeks someone called me, he wanted to hire our firm to promote his business. So I asked him what exactly does he want us to do for him. He said, “I want you to do digital marketing for me”. I said, “Oga, please which aspect of digital marketing do you want us to do for you?”. He said “All of them”. The truth is that digital marketing is much deeper and intricate than what most people think about it. It takes months and years of constant practice to master some of the processes. 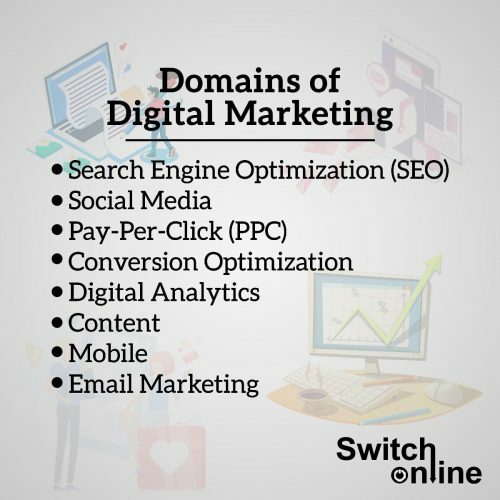 I want to share with you some of the domains of digital marketing. This is about making your blog, e-commerce store, other sites to have a good and high ranking on Search Engine Result Pages (SERP) like Google, Yahoo, Bing and other search engines. A site with better ranking will definitely attract more visitors. A thorough keyword research (the words users type on search engines) and audience research (the people that will use the keywords) is required for proper SEO. If your aim is to have a blog or manage one, this knowledge will help you. The use of social media platforms to promote products, services, corporate brand and personal brand. Social media platforms like Facebook, Instagram, Twitter, LinkedIn, Pinterest. Although LinkedIn loves projecting themselves as a professional network rather than a social network. An advertising model that is used to direct traffic to websites. The advertiser pays the publisher once the advert is clicked. Search engine advertising is a form of PPC. This is where you measure the Key Performance Indicators (KPIs) in digital marketing. With digital analytics, you can measure the performance of your posts using metrics such as video views, download rates, traffic sources, bounce rates, demographics, behaviours, audience and so much more. This is simply the creation and distribution of ‘valuable’, ‘relevant’ and ‘consistent’ content with the aim to attract and retain a certain kind of audience. The aim is to convert these audiences into future customers and brand advocates. Researching what appeals to your audience is very important in developing your contents. Content can come in form of articles, posts, images and videos. Globally many people are connecting to sites with their mobile devices, also there are many apps for the billions of mobile devices globally. Advertising in apps helps to drive brand awareness globally. This is the sending of electronic mails to an audience with the aim of converting them into customers. It is still a very effective form of digital marketing.